In any kitchen, a range hood is essential—whether vented directly outside or not. But vented range hoods offer several advantages over non-vented (or ductless) hoods, which is why they're worth including in a kitchen remodel if you don't already have one. Here are some reasons you may want to consider adding a vented range hood. When you get new kitchen cabinets, you'll want to do everything you can to keep them looking nice for years to come, and controlling the humidity in your home is one way to do that. High humidity can cause wood to swell, creating noticeable and sometimes permanent problems such as warping, buckling, or bowing; changes to stiles and rails on cabinet doors; and exposed stain lines or unfinished areas due to movement of pieces. The process of cooking causes moisture to be released into the air, whether you're cooking a pot of pasta or soup on the stovetop, a roast in the crockpot, or a bag of steamed vegetables in the microwave. By far, one of the biggest advantages of vented range hoods over non-vented ones is the fact that they take the excess moisture in your kitchen and release it outdoors. This helps keep the humidity levels in your kitchen under control, protecting your cabinets, walls, and trim from problems related to excess moisture. Both vented and ductless range hoods help control cooking odors, but vented ones are typically much more effective because they actually release cooking odors outside, whereas non-vented ones use filters to remove odors from the air and recirculate it back into your kitchen. You might not think about it until it's time to clean your cabinets, appliances, backsplashes, and other kitchen surfaces, but when you cook with oil and grease, a layer of grease can accumulate on your kitchen surfaces over time without the use of a range hood. Ductless range hoods do help filter grease from the air and are better than using nothing at all, but again, vented range hoods are much more effective at removing grease particles from the air and releasing them outside. Another thing ductless range hoods don't do very well is keep your kitchen from getting hot when you're cooking. The recirculated air that they blow back into the room isn't cooled—it's simply cleaner. Standing in the path of the blowing air might make you feel a bit cooler, but overall, the temperature in your kitchen will still rise when you're cooking. Since vented range hoods remove and release hot air while you're cooking, your kitchen will stay much cooler overall. 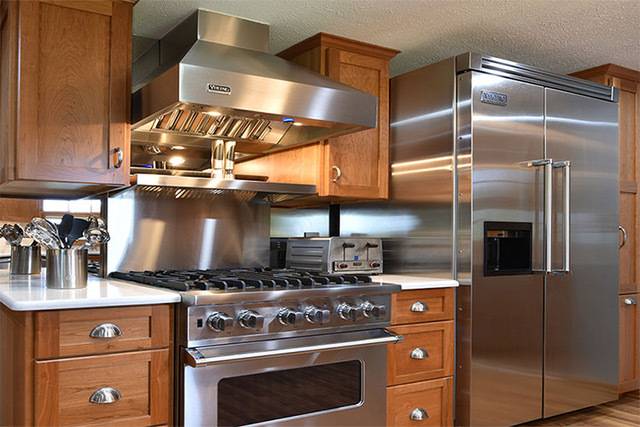 If you're considering a kitchen remodel and don't already have a vented range hood, we can most likely help you include one in your new kitchen, depending on your kitchen's layout and where your kitchen is located within your home. It's definitely an investment worth considering, since your new kitchen cabinets, other nearby surfaces, and indoor air will stay much cleaner and more comfortable with a vented range hood.